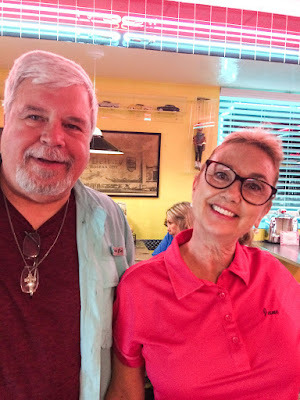 Joanie and I helped my brother a little with moving my father to an assisted living facility in Boynton Beach, Florida. The move was something he really did not want to do. However, his safety was becoming too much of an issue. We pray that he will transition easily and find new friends there. 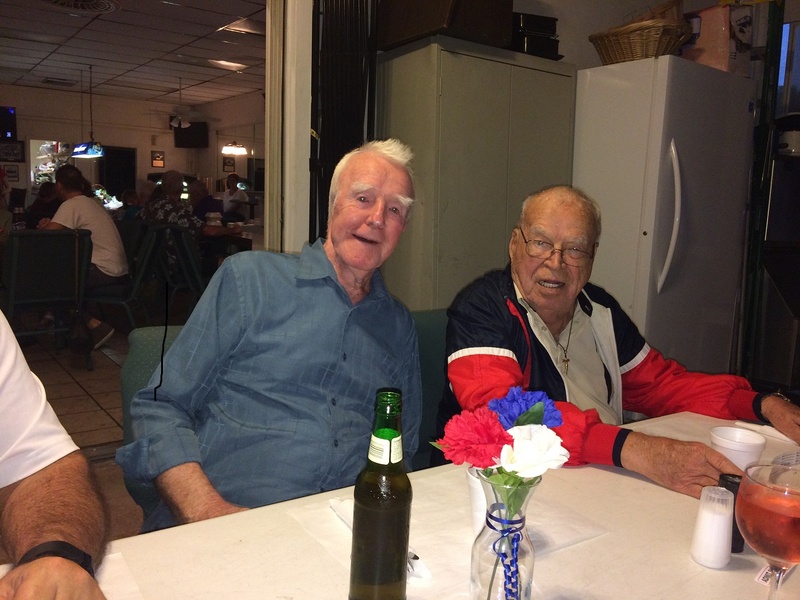 We had dinner at the local American Legion Post in Boynton Beach on Veteran's Day with my dad's friend and tennis buddy Duke Baun, a Marine during WWII. 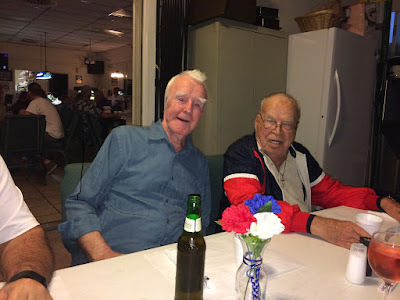 To the right is my dad, a WWII Navy veteran. We had dinner one evening at Ellie's 50's Diner in Del Ray Beach. Joanie thought this waitress looked a little like Hillary. The waitress said we were not the first to tell her that. 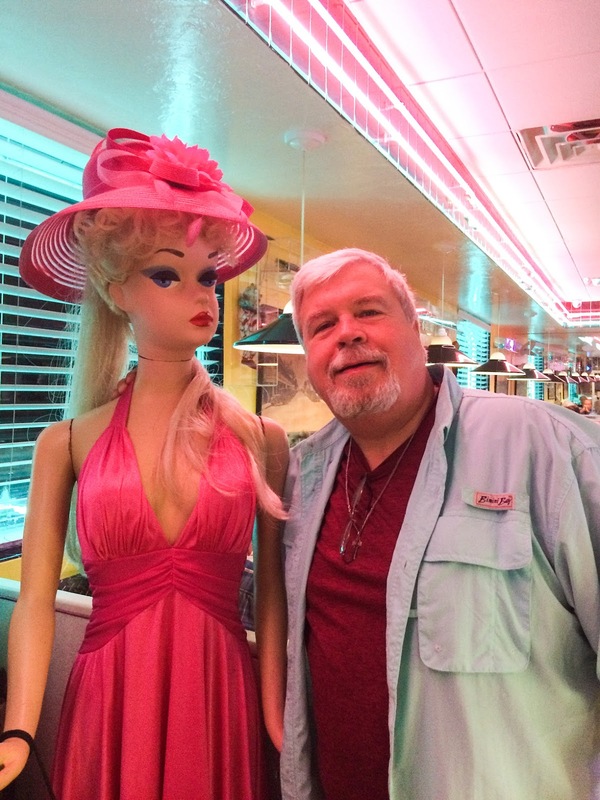 This young lady, who looked remarkably like Barbie, was very quiet and a bit standoffish. 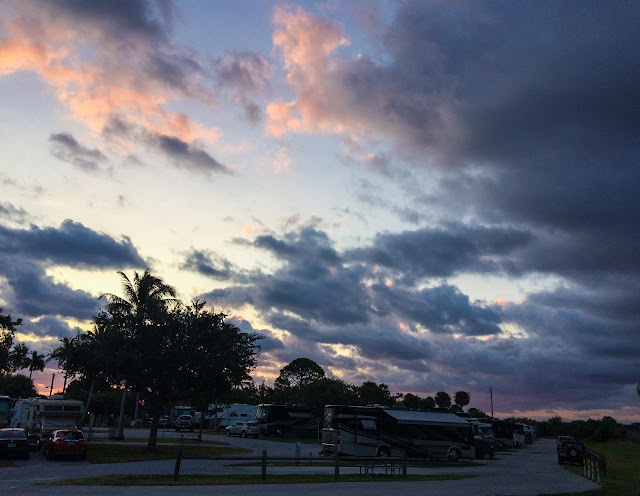 The weather, of course, is why so many people are attracted to Florida. Lobo and Juniper had just become acclimated to autumn when we brought them back to summer time. They may have been a bit confused. We broke the 820 mile trip down into 3 days of travel. Boynton to St. Augustine. St. Augustine to Walterboro, SC, then Walterboro to New Bern. Most of the way on I-95. Leaving Walterboro, we saw the smog created by all the wildfires in the Southeast. The wildfires also made the Super Moon look pink or gold. Over on the left side of the highway you can see a hurricane damaged bill board. We saw hundreds of wind damaged signs and billboards and a few toppled barns. 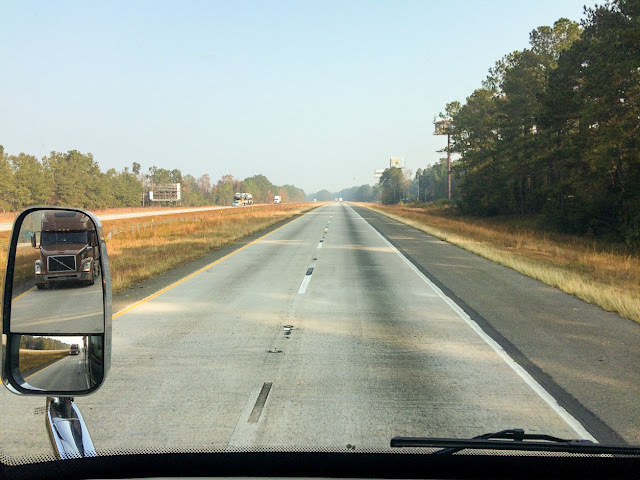 Road crews from Florida to North Carolina are still very busy removing all the tree debris. 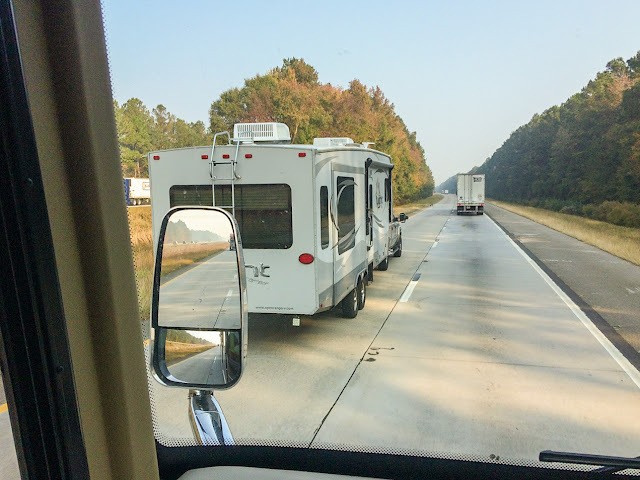 Headed north on I-95 we encountered a steady stream of motor homes, fifth wheels and travel trailers headed south - snow birds escaping the coming winter. We kind of felt "odd man out" heading north. Occasionally we had a little company and felt better. (Look in my side view mirror). 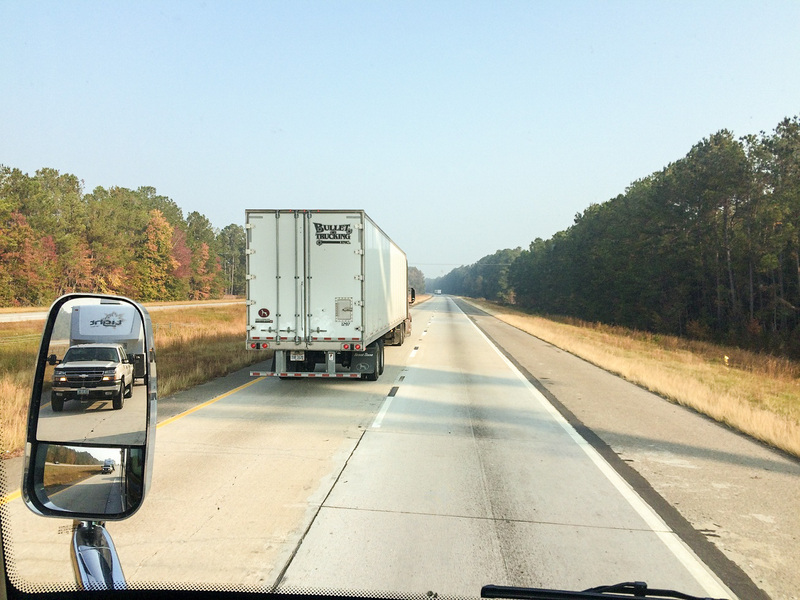 The trip north on I-95 was uneventful until we exited on to US-13 and then on to NC 55 to head east to New Bern. We encountered much more devastation from Hurricane Matthew. This time it was the Neuse River valley. The detours from washed out roads and highways added more than an hour to our trip. We also saw so many homes and businesses damaged from the floods. Huge piles of household debris have yet to be picked up. We need to keep these poor people in our prayers.